Preheat oven to 350°. Line 2 cookie sheets with parchment paper and set aside. Whisk together the flour, poppy seeds, and salt in a medium bowl. Set aside. Using an electric mixer, beat the butter and sugar in a large bowl until creamy. Beat in the egg yolks. Mix in the vanilla and orange zest. With the beaters on low speed, mix in the flour mixture just until the dough starts to come together. Using your hands, work the dough into a ball. To make the orange sugar, whisk the sugar and orange zest in a small bowl. Set aside. 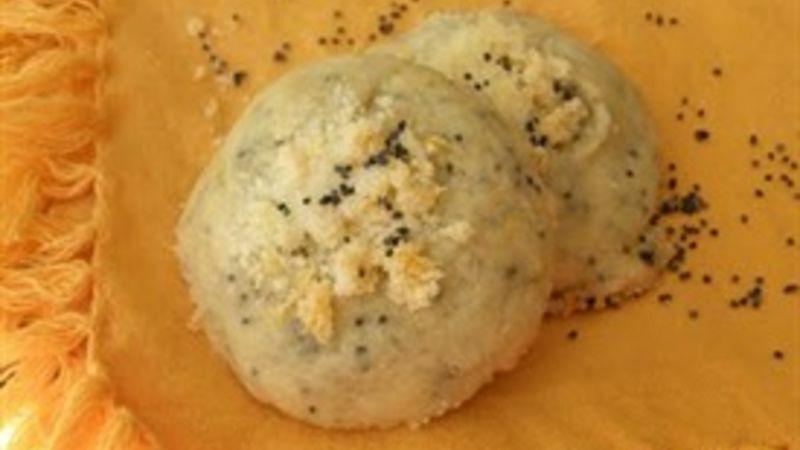 Pinch off small clumps of dough and roll into balls about 1 inch in diameter. Place on the prepared cookie sheets, about 1-1/2 inches apart. Press down on the balls with your fingers to form rounds that are a scant 1/2 inch thick. Spoon 1/4 to 1/2 teaspoon of orange sugar onto the top of each round (I liked the 1/2 teaspoon amount), pressing down gently so the sugar adheres. Bake for 13 to 15 minutes, or until the edges are golden and tops feel mostly firm. Transfer the cookies to a rack to cool completely. These cookies keep very well. Layer between sheets of wax paper in an airtight container for up to 10 days.